It’s that time of year again where we show a little bit of love towards that special someone. You know what I’m talking about… Valentine’s Day! Exercise: All horses should exercise for about 30 minutes to an hour, three to four times a week at the very MININUM. You can ride your horse up to six times a week; a horse should always have at least one full day of rest. Remember it is crucial that you always warm up a horse before exercising, and to cool down after exercising to prevent an injury. A Healthy Diet: Horses require six main types of nutrients to survive, they include: water, fats, carbohydrates, protein, vitamins, and minerals. For information regarding a healthy diet and the best ways to give your horse the nutrients it needs Click Here. This fact was created by Dr. Williams and will give you a quick rundown of what a horse needs. Checkup: This might be the most important, but make sure your horse is visiting the vet at least 2 times a year and that their vaccines are up to date! To see what your horse should be vaccinated for, take a look at our Vaccination Educational Resource Kit Here. So the next time you see a heart candy or chocolate I hope you remember to keep your horse’s heart heathy. And while you’re thinking of keeping your horse healthy, take a look at what INFH at Rutgers is doing! 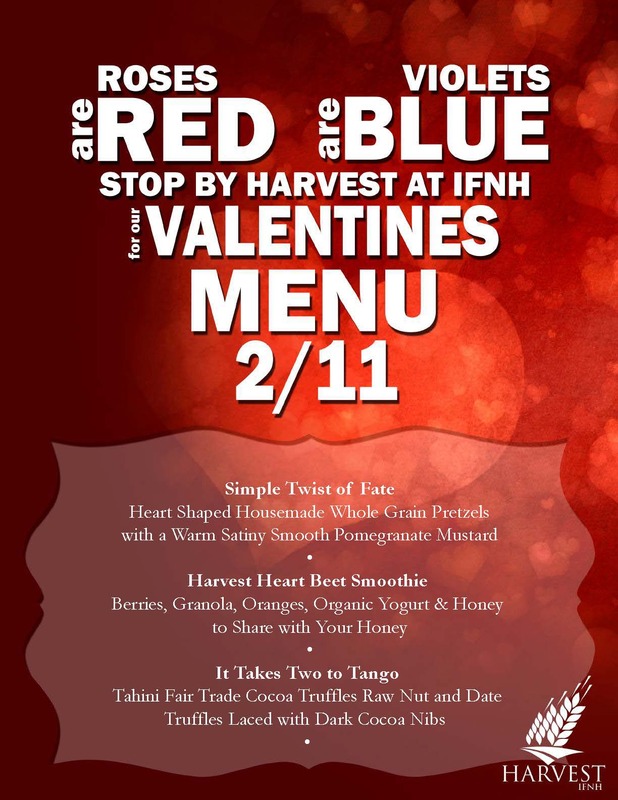 Its new café Harvest is offering a healthy “Valentine’s Menu” tomorrow, Thursday the 11th! Be sure to check it out. Learn more about Harvest Cafe Here! I hope everyone has a happy Valentine’s Day and don’t forget to spoil your horse with love! WE have feelings too! Until next time.